So, I enjoy travel. Trains are, of course, the very best form of transportation ever, but on a good day you can see some really really beautiful stuff out the window of an airplane. Sometimes, I will even try to snap some pictures, and sometimes, they even come out pretty well. Cathy Davies, an artist based in Los Angeles, has similar feelings about the relaxing joy of looking out of an airplane window. So much so that she has built a screen saver to simulate the experience. Neater still, last April (when I was really down in the dumps) she contacted me for permission to use one of the pictures I had taken out of the airplane window, and posted to Flickr under a CC license. Well, last month she wrote to announce that despite some delays induced by carpal tunnels, she was at last shipping her newest creation: Holding Pattern 2.0 . . . I have been behind on e-mail but I should get a chance to try it out myself really soon, as she offered me a complimentary copy in exchange for my picture. 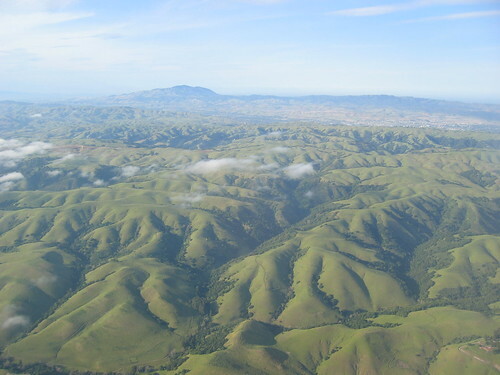 If you visit her download page, you’ll see this photo I took of Mount Diablo in May, 2005. At least, I’m pretty sure that’s Mount Diablo, as seen from about Hayward . . . It is gratifying for me and very neat to see that something pretty I caught with a camera one day be put to further creative use. There may even be a few people out there getting a bit of calm from the relaxing illusion of flight, and I like the thought of having contributed to that. Regarding Mountain View burrito restaurants, if I recall correctly, La Costena annoyed me because it involved driving and too many choices, so I’ve always been a Los Charros guy. I think we had La Costena the day Tellme had its first round of layoffs. We were in mourning for a fallen comrade and we needed to get AWAY so we got burritos and ate them in the park. Since it was on the company tab, Joe ordered their very largest burrito, which was, as he described it “about the size of a baby.” It took him two days, but as I recall he says he ate every bite. A must-read for anyone who digs burritos, tunnels, tubes, advanced physics research, or refried beans. Today, I was invited to add the crazy naked lady to the Flickr wheelchairs pool. So, I took another look at the photo, with an eye toward the old lady in the wheelchair, and figured I’d play with a crop to see if I could re-balance the scene a bit. Tim! I shall steal this from you, as you stole it from Kurt, verbatim! Because it is good stuff! Ok, let’s have some fun. Let’s talk about women. Freud said he didn’t know what women wanted. I know what women want: a whole lot of people to talk to. What do they want to talk about? They want to talk about everything. Most of us, if we get married nowadays, are just one more person for the other person. The groom gets one more pal, but it’s a woman. The woman gets one more person to talk to about everything, but it’s a man. I met a man in Nigeria one time, an Ibo who had six hundred relatives he knew quite well. His wife had just had a baby, and they were taking it to meet all its relatives. Everybody was going to hold it, cuddle it, say how pretty or how handsome it was. Wouldn’t you have loved to be that baby? I sure wish I could wave a wand, and give every one of you an extended family, make you an Ibo or a Navaho or a Kennedy. I hope America, over the long run, finds some way to provide all of our citizens with extended families – a large group of people they could call on for help. Living in California has caused me to worry, in varying degrees, about the need for family connection. Although the pay wasn’t great, I really enjoyed living in Chicago the last time around, in part because I was near family and because the Office was a close-knit bunch. Two tribes! Right after the marriage I accepted the raise to move to Walnut Creek, and I did worry somewhat that leaving family and friends behind could make the marriage more difficult . . . but that we’d do alright. Living in San Francisco, though, is much better. Plenty of social activities even for those of us between families, between jobs . . . and you don’t even have to drive to get there! (Parking is horrible, anyway.) But, yeah, next marriage, especially when we get to child-rearing time, we want to be a little more vigilant that we have got some manners of family to back us up! HubPages: Authors Get a Share! So, I have lately been doing more research than usual on interesting startups. One that seems particularly interesting to me is called HubPages. The idea is to make it easy for people to write up an ever-growing collection of informative articles, and to give them incentive to contribute their knowledge. They provide a nice, dynamic interface that allows authors to very easily mix written content with images. Users then get a chance to vote on what content they like, which should allow for quality control, as well as ego stroking, since authors can then rise in popularity through an online social network. HubPages then cranks it to eleven by making it trivial to integrate your Google AdSense or Amazon.com Associates accounts with their infrastructure, which allows you the chance to share in the revenue opportunities that HubPages might gain from your writing! I gave it a try, and I found the linking surprisingly easy. This looks like a really easy way for authors to earn a little money by contributing knowledge. That’s what I have written up so far . . . as a spoiler: I made it to Pueblo just fine, replaced the starter myself, I bought a new camera, we celebrated Gwen’s birthday, had some quality time, and then since I couldn’t spend enough time in Pueblo, I took Dad back to San Francisco with me, where he spent a week that we both enjoyed a great deal. I dropped him off in Emeryville and he took the train home. Last Wednesday I went with a friend to see the awesome movie “The Valet” and on the way to the movie I got a call from Dad that he had driven the car to Wal*Mart, which had been a scary ride for Gwen, but proof that he could help drive on their own road trip to Chicago later this month. At any rate, I hope to write a bit more about these things, but I make no promises. Along the way, I am still uploading pictures, so keep an eye on Flickr, and if the remainder of the trip interests you, you can skim over the “Colorado Road Trip April, 2007” collection. So, I have a few gazillion things I would like to do, and some free time to play with. In terms of “professional development” I am looking for work, but more interesting to me is to have some time for education. I know an awful lot of things, especially about systems administration, and there are plenty of things that I don’t know, some things you would think I have done, but haven’t, and then there’s adding new stuff like learning Ruby on Rails, which could be danged handy if I choose to pursue contracting. To that end, I’ve had the “Agile Web Development with Rails” book collecting dust for a while . . . and a Macintosh desktop, to keep Unix confusing. I’m into Chapter 3: Installing Rails, and the instructions for me don’t quite cut it, and a link they provide to Lucas Carlson’s blog no longer exists. But that needn’t stop us, because Google found me a very handy tutorial from Hivelogic: Building Ruby, Rails, Subversion, Mongrel, and MySQL on Mac OS X. It is from February and it does an excellent job of walking through the steps to fetch, build, and install the various pieces on a Macintosh, in /usr/local, like a real Unix system, and explaining all the important bits like fixing your $PATH and installing Xcode, and what the heck is sudo anyway. Stepping through the article is a breeze and you are left with a working Rails server, backed by MySQL, and the beginnings of a clue as to contemporary “best practices” like deployment-via-Capistrano. Huzzah! Anyway, now I have a working Ruby setup on this computer, and I can hitch along to the next chapter, where I’ll learn to hop a freight. What’s up with JPG Magazine? Paul and I talked about all the different magazines we’d start, but ultimately decided to begin with JPG. The brand had two years of momentum behind it and a strong community. 8020 bought JPG from Heather and I for a modest sum. We are no longer working for JPG Magazine or 8020 Publishing. Why? The reasons are complicated, and the purpose of this post is not to air dirty laundry – it’s just to let the community know why the founders of JPG are no longer there. We owe you that much. Here’s where the whole “not lying” thing comes in. I just could not agree to this new story. It didn’t, and still doesn’t, make any business sense to me. Good publishing companies embrace their founding editors and community, not erase them. Besides, we’d published six issues with participation from thousands of people. There’s no good reason to be anything but proud of that. We had a long meeting with Ron. I tried to compromise. I suggested we add text to the website, explaining the difference between issues 1-6 and the new issues. I wanted to embrace the truth: Tell people how we started, how we grew, and what we were now. It’s the story of how a successful, organic community begins. It’s the story of how authentic media gets made. And it has the added benefit of being true. Compromise could not be reached. It became clear that we could not continue to work together with this fundamental disagreement. And because he was the CEO, I was the one who would have to leave. I still own a percentage of the company, so I hope to see JPG continue to grow and prosper. Unfortunately, it will be without its founding editors. Note: Typos corrected and the emphasis is mine. The historic figure of Daniel was a pious Jew who spent most of his life away from his kinfolk, working for King Nebuchadnezzar II of Babylon. Daniel interpreted the handwriting on the wall that had been left by Angels, which foretold the imminent assassination of King Belshazzar and the subsequent fall of Babylon to Persia. Under Persian rule, Daniel was given great administrative authority, and likely played a significant role in freeing the Jews from the “Babylonian Captivity”, though he himself did not return to Jerusalem with them. Later in his life, Daniel ministered as a prophet. In Christianity he is one of the “four great prophets” but in Judaism, he is not regarded as a prophet, because he did not speak directly with God. Daniel’s fidelity to God exposed him to persecution by jealous rivals within the king’s administration. The fact that he had just interpreted the emperors’ dream had resulted in his promotion and that of his companions. Being favored by the Emperor, he was untouchable. His companions were vulnerable to the accusation that had them thrown into the furnace for refusing to worship the Babylonian king as a god; but they were miraculously saved, and Daniel would years later be cast into a den of lions (for continuing to practice his faith in YHWH), but was miraculously delivered; after which Darius issued a decree enjoining reverence for “the God of Daniel” (6:26). He “prospered in the reign of Darius, and in the reign of Cyrus the Persian,” whom he probably greatly influenced in the matter of the decree which put an end to the Jewish Captivity (B.C. 536). Anyway, if I wanted to draw anything from this namesake, it would be that spending most of your adult life far from home serving a doomed empire is perfectly reasonable, but keep pious in order that one may interpret the “writing on the wall” which can lead one to develop the power to free people. Piety will further bring the benevolence of God, which will come in damned handy on those occasions when one is tossed into the lion’s den. And here I am sitting around in California with the moniker “dannyman” which could be read “judge is man” . . . which strikes me as awfully impious. I guess I’ll have to try harder. And I’ll have to rely on my own good judgment. Dang. Systems Administrators can be an uptight bunch. In the past few weeks I have twice spent some time amidst my fellow professionals. Most are nice people, a good many are inoffensively undersocialized, and a noisy minority are just flamingly obnoxious. (I have, at times, been flamingly obnoxious.) Two nights ago one of my fellows recommended Cory Doctorow’s mind-churning post-apocalyptic masterpiece “When SysAdmins Ruled the Earth” . . . I dare you to read it! Not long ago I joined a professional mailing list, and today I thought I would chime in on the topic of mobile phone reimbursement. I received a polite note from the list moderator: my message had bounced, could I please re-sends the message as plain text only. These days I am using Gmail, which sends messages in the ubiquitous multipart/alternative format, which leads with text that is followed by a potentially-prettier HTML “alternative”. I was sitting around, minding my own business, when I got some weird-messages-from-friends via this AIM screen name “buddybulletin”. I wrote back and it walked me through sending a “blast” to a group of friends–I’m sorry about that. Then a friend inquired as to buddybulletin’s parentage. Danny: I dunno, I’m sure you can Google it. Duncan: I did. Unless it’s very new and Dutch, there’s nothing. Duncan: So it’s very stealth; real-time viral only and very stealth. Sponsored by T-Mobile Sidekick ID. It is listed by AOL and the “AIM Bots” page. The Sidekick ID looks potentially neat. It looks like something between a Sidekick 2 and a Sidekick 3: without Bluetooth, camera, MP3 player, card slot or USB port. This way, it retails for $99. It also looks more rugged, like the Sidekick 2. So, if I’m ever in the market for an upgrade . . . Interesting viral marketing, anyway. They should have some sort of “opt-out” doohickey for those of us who associate with curmudgeons. I think it was last week that I attended a presentation at Adaptive Path, where Scott Berkun gave an engaging presentation based on the material he presents in his new book: The Myths of Innovation. He is a very engaging speaker and the presentation was a treat. He got me thinking about innovation, what it means to be innovative, and what to expect along the way. Innovation doesn’t just happen: apparently, Newton may never have been struck by an apple, but even if it did, it was just one of many inspirations along with a subsequent twenty years of work to describe the mathematical idea of gravity. History picks winners and heroes to remember, but the truth is that innovation is the product of taking many many new ideas and putting together something new. Standing on the backs of giants . . . If Scott’s words intrigue you, you can explore a bit further: read a sample chapter (pdf), check out a “teaser video” that Scott produced, or buy the book online from Amazon.com. Management that is destructively critical when mistakes are made kills initiative. And its essential that we have many people with initiative if we are to continue to grow. One thing I have enjoyed about working for smaller companies in the Silicon Valley is the degree to which employees must be trusted to take the initiative. This can mean a lot of hard work, of course. But it also allows one to exercise the passion that they feel for their work. Passion stimulates initiative. You have to start somewhere and since initiative must vanquish inertia, you had better have a reason to expend so much energy. Alas, it is a lot like falling in Love: passion begets a broken heart. It took years to overcome my first heartbreak and years to heal from the pain of disillusionment the first time I was laid off. Sometimes, to avoid pain, we limit our ambitions in work and love, and we refrain from committing ourselves to opportunities to create something wonderful. But that only leads to more profoundly tragic disappointments. I think that if you have the good fortune to find yourself passionate about something, then perhaps what you need to do is to cultivate initiative; Passion is the why and initiative is the what. When you fail in the pursuit of your passion, initiative can sustain you: when you lack the why, at least you still have the what. With a faith in your initiative and a mind open to new opportunities, you should sooner find the next thing that captures your passion, and you can fall in love anew, backed by the strengths gained from previous endeavors. To achieve demands discovering personal motivations and learning to use them. The masters in all fields are foremost great self-manipulators, orchestrating their will to achieve what the rest of us can not. However, since our minds are the only ones we see from the inside out, there can be no true handbook for motivation: only a treasure map of landmarks and a handful of bones to roll. The Discipline: Whenever you find yourself unmotivated, run the list of feelings and questions of likely motivations and see which ones get your heart rate going. It takes discipline to seek motivation when feeling unmotivated, but that’s the difference between commitment to a craft, and beer fueled fantasies. In my corner of the world, I have been reading up on Ruby on Rails and finishing (Berkun’s) “The Myths of Innovation” . . . and I have two slender books on the way, “The Rational Guide to IT Consulting” (recommended by Haidong) and its cousin, “The Rational Guide to IT Project Management” . . . I have some ideas of things I want to pursue, and a hope that I should have something more interesting to show before long, so that when I find a job opportunity I really really want, I will have something exciting to show for it. Pride: Have no critics? Set a goal for yourself you’re not sure you can meet. Write it down, sign it, post it on your bedroom wall, showing it to friends and family so there’s no way to sneak out the back door.